SSR has the experience and understands the requirements for a competitively priced bulk grain haulage rail solution for its customers across Australia. SSR is very familiar with both the domestic and export heavy haulage tasks, and the management team possesses the necessary experience with grain haulage rail freight services. Our team of dedicated employees have extensive experience in designing heavy haulage solutions to meet the unique needs of our diverse clientele, including the transport of containerised grain via intermodal freight. 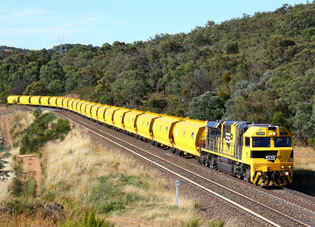 When moving delicate commodities, you want rail freight services that are fast, efficient and reliable. SSR employs a team of experienced professionals that work hard to meet customer expectations while giving careful attention to safety, time constraints and budget considerations. Rail freight across Australia can represent an effective means of transporting your goods, and combined with the careful attention offered by the team at SSR, you can have confidence in the fact that your shipment is being looked after. SSR has the resources and industry expertise to design the perfect solution to your requirements for rail freight in NSW, Victoria and across Australia. Get in touch with us about your unique requirements and let our team go to work for you.